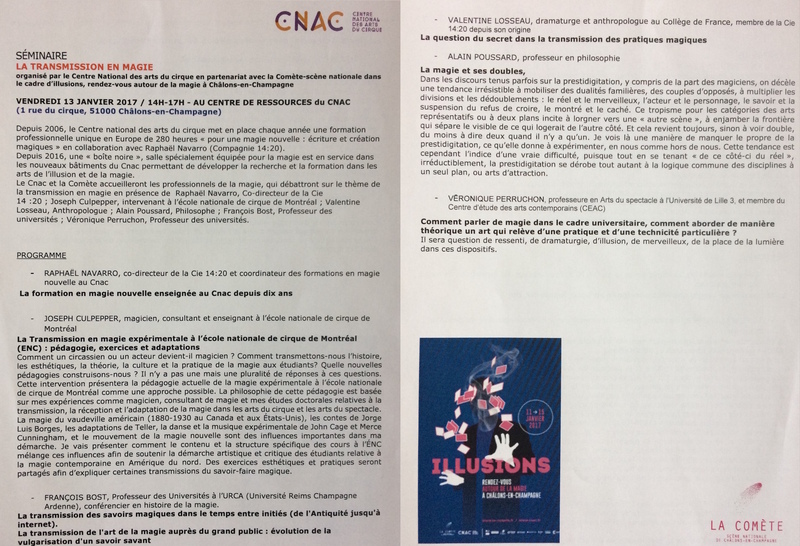 What a thrill to be here for the Illusions festival in Châlons-en-Champagne where the CNAC is celebrating 10-years of magie nouvelle. 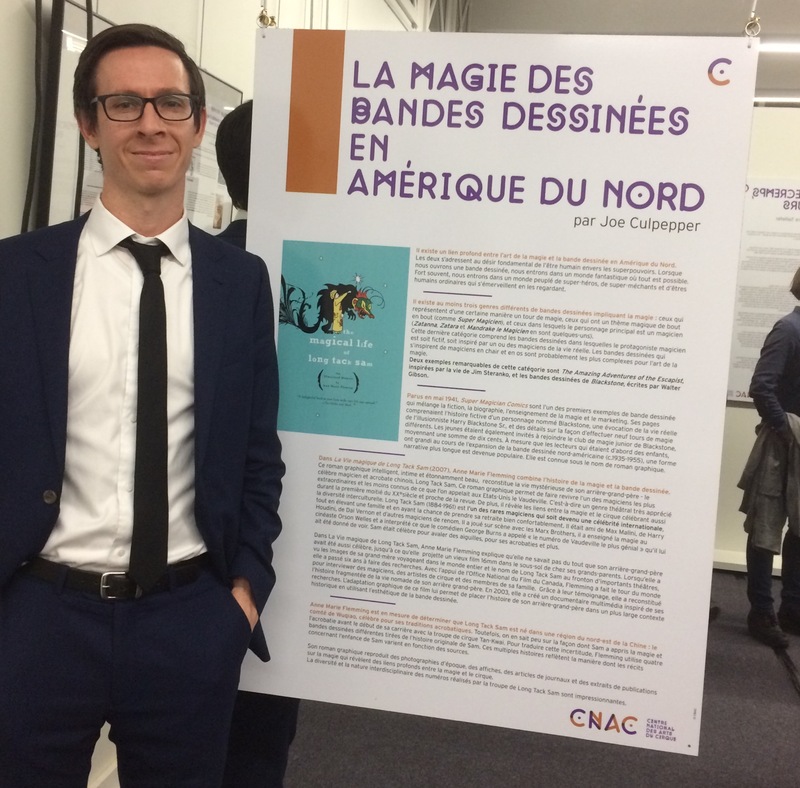 I would like to thank Gérard Fasoli, Cyril Thomas, Barbara Appert-Raulin, Jeanne Vasseur and the entire CNAC team for making my participation at this international event possible. Pascal Jacob, Christian William and the CNAC resource centre curated two lovely exhibitions of magic posters and rare books with direct links to the circus arts. Locals can visit these exhibitions until they close on January 25, 2017. I am happy to have contributed a brief text celebrating North-American magic comic books and the wonderful graphic novel — The Magical Life of Long Tack Sam — by Canadian author Ann Marie Fleming. For those of you who don’t know, Long Tack Sam was a Chinese acrobat, magician, and international celebrity. You can learn more about him by watching the documentary film Ms. Fleming made about her great-grandfather at the National Film Board of Canada’s site. After Pascal Jacob introduced the Ouvrez les grimoires and l’Épopée de la magie exhibitions to the general public, spectators attended a grand evening of close-up magic. Four different up-and-coming close-up magicians performed fifteen-minute sets in a uniquely staged environment. On Friday the 13th, an auspicious day for any presenter, I had the pleasure of presenting a talk among a diverse group of fascinating individuals in the professional seminar titled La transmission en magie (Transmitting Magic). Raphaël Navarro, Valentine Losseau, François Bost, Alain Poussard, Véronique Perruchon and myself all spoke about different aspects of how magic is transmitted from one person to another based on our areas of expertise. The images below display the programme of the seminar. After this event, Pascal Jacob gave an engaging talk for the public filled with stories about magic from the time of Ramses II to the most recent J.K. Rowling books. We were then able to see the premiere of Thierry Collet’s Dans la peau d’un magicien, RDV#7. As I write this, Philippe Beau’s Magie d’ombres et autres tours is about to start at the national theater here named La Comète! I’d better publish this post and head off at lightspeed to catch it.